The OpenRCT2 Project almost makes up for RollerCoaster Tycoon 3 being pulled from Steam. This article was originally published in PC Gamer issue 319. For more quality articles about all things PC gaming, you can subscribe now in the UK and the US. 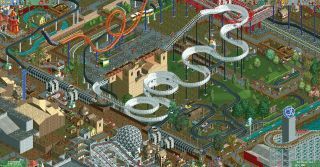 RollerCoaster Tycoon 3 may have been taken down on Steam, but the superior second entry in the series is still there to grab, and by downloading the open source OpenRCT2 Project alongside it, you’ll be able to unlock the game’s true potential. The project adds a load of new features, such as being able to fast forward your scenario and adding multiplayer, as well as fixing many old bugs and raising a lot of the game’s limits so you can create the park of your dreams. It may come as a surprise to see the RCT community continuing to flourish 20 years on from the first game, and despite the fact that the most recent entry in the series by Atari hasn't been good enough. Instead of diving into new games in the genre, such as the excellent Planet Coaster and Parkitect, players continue to be drawn back to the simple isometric charms of RollerCoaster Tycoon, creating masterpieces in the process. Filled with nostalgia and the overconfidence that I too can become a master designer, I’ve decided to put OpenRCT2 through its paces and will hopefully manage to build some semi-decent rides in the process. I’ve picked Forest Frontiers and Dynamite Dunes as my starter scenarios (you can also access the original RCT tracks in RCT2) to ease myself in while trying to add a few flourishes along the way. While others are creating far more impressive rides and parks than you’d ever think possible with the base game, I’ve found it much easier to experiment with my designs here. The most noteworthy thing OpenRCT2 gives you is the freedom to play with the scenery more. Money is no longer a concern when you can gift yourself regular cash injections, and you can turn off height clearance so that your paths and buildings can be placed closer to the support beams of your rides. While it was possible to craft buildings to house your rides or huge towers to add ambience in the original, the changes certainly make it easier here. After unnecessarily worrying about my bland log flume, I realised I could take my time adding water features and tunnels, elevating my sad little course from a wooden turd navigating a chute to something Walt Disney could be proud of. The ride travels around other attractions, at one point disappearing underground for a deceptively long drop. The ‘cheats’ added here may seem basic, but they also make it easier to relax and go wilder with your designs. The multiplayer servers are a fun addition and source of inspiration if you don’t mind beating yourself up about how talented everyone else is compared to you. You can either start your own park or join someone else’s server and start building. While, in theory, you could mess with other peoples’ builds, the community seems very welcoming and is happy to collaborate, even if your addition of a go-kart track uglies up a beautiful castle theme. Other servers are also a great source of ideas—I found myself poking around other peoples’ parks for any coaster designs I could save to use in my own parks. I end up pinching a wooden coaster, a suspended one and a cute-looking gentle car ride for later before having a little cry over my lack of talent. Annoyed that my coasters still have a long way to go, I leave the rides and park management side of things alone while I attempt to create some pretty gardens instead. Inspired by the online servers, I try my hand at building a small barn using the miscellaneous pieces provided and stick a burger shop inside it. With everything ticking over nicely, I fast forward the game speed to watch the money roll in and sprint towards my completion goals. It’s a handy little tool when so much of your park’s life can feel like slow going. There’s also an option to end a scenario early if you’ve met the conditions well before the timer runs out, which I had not. That’s because my garden preoccupation had come at the expense of the rest of my park. Overwhelmed by vomit from a slightly too intense rollercoaster I’d built, my park is looking less like a beautiful day out and more like the pavement outside a kebab shop on a Friday night. Thankfully, there’s a new button which instantly clears the dripping chunks from my pathways, meaning I can continue to pretend I’m a competent manager. It’s also possible to do the same thing with the grass, instantly mowing fields so everything looks neat enough to win you that coveted ‘tidiest park’ award. All of these little additions change RollerCoaster Tycoon from being a management game into a design one, and that’s no bad thing—the longevity and joy of RCT is in the freedom of its creative side. You can build the park of your dreams with coasters that no sane person who values their intestines would think about riding. It’s a great way to return to such a wonderful classic PC game. I’ve become hooked all over again.